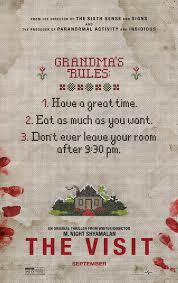 For his latest film THE VISIT, writer/director M. Night Shyamalan has made a horror comedy. On purpose, this time, as opposed to the accidental hilarity of his 2008 killer pollen flick THE HAPPENING. And indeed, there were shrieks and laughter aplenty at the advance screening of the film I attended, although the humor sometimes felt awkward and uncomfortable, and the whole film felt a little.. off.. The closest thing I can compare it to is Neil Labute’s infamous remake of THE WICKER MAN. THE VISIT is a found footage/mockumentary style horror film ala THE BLAIR WITCH PROJECT, et al. What we see is through the video camera lens of 15 year old Becca (Olivia De Jonge) who, along with her 13 year old brother Tyler (Ed Oxenbould) has been sent off on a weeklong visit with their mother’s estranged parents while mom (Kathryn Hahn) goes on a cruise with her boyfriend. Mom won’t say what exactly happened on the day she left home at the age of 19, but Becca is determined to find out in the course of making a documentary on this chapter of her family’s history. When the kids first meet their grandparents in the daylight, they seem like genial enough old folks. It’s when the sun goes down and the kids go to bed that strange things start to happen. Are the old folks possessed? Just sick and/or maybe a little senile? Or is there some other dark secret they’re hiding? Shyamalan’s trademark twist this time around is a familiar one for any fan of seventies drive-in horror movies, but if I were to get specific and name names I’d pretty much give it away. Suffice it to say that a basement figures into the plot, and the kids are advised not to look in it. Considering the way some films push the limits of PG-13, it feels a bit too strong a rating for THE VISIT, a film that seems aimed primarily at a pre-teen audience. There are only a few fleeting, non-gory glimpses of murder victims, and profanity has been replaced with the names of female pop singers (it’s weird, but is explained as a conscious choice by Tyler). I wouldn’t take my 4 year old to see this movie, but I’d say most kids 8 and up looking for a fun scare would be fine, and who better to laugh at jokes about dirty adult diapers? Most of us have at least a subconscious fear of growing old, and kids can sometimes feel uneasy around their elders, viewing them as some kind of “other”. For the most part Shyamalan plays on those fears well here. In doing so, however, he portrays the geriatric menaces in his film in an exaggerated, monstrous way that I’m sure some viewers will find tasteless and offensive, so consider yourself forewarned. As much as parts of the film work, it has such an odd, off-kilter feeling to it that it’s hard to pin down and assess on a qualitative level. To his credit, Shyamalan really seems to go for the gusto here, making no attempt to smooth out his odd vision into something more traditional. That said, there are still more than a few times when I wasn’t sure if I was supposed to be laughing or not. I think the end result is still kind of bad, but it’s a heartfelt and entertaining bad that hits about as much as it misses. And for better or worse, it’s such a singular film experience it’s almost certain to stay lodged in the old memory bank, at least until I become senile myself. 2 ½ out of 4 stars.